Learn how independent insurance agencies can utilize technology to stay ahead of their competition in 2019. Things have changed a great deal since 1861, when the first P&C company opened its doors in London to offer fire insurance. While insurance itself remains a constant, the insurance experience business owners desire is changing radically. Independent insurance agents who don't provide the digital experience their customers desire won't survive. 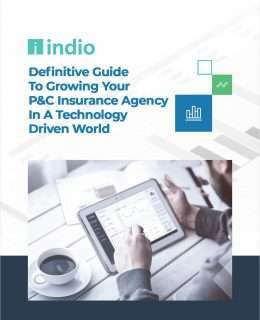 This new guide from Indio Technologies provides best practices for independent insurance agents looking to stay competitive and grow their business in the digital age. "Technology in the insurance industry is becoming increasingly more disruptive and dominant, similar to the impact technology has had in other financial service industries, such as banking. And like bankers, the insurance agencies that learn to use and leverage technology will thrive in the new environment while “dinosaur” agencies will be left by the side of the road." The Definitive Guide to Growing Your Insurance Agency in a Technology Driven World is an important read for independent insurance agents and staff.